Hyperbolic claims about the Tea Party are nothing new from the mainstream media, but now admitted plagiarist Fareed Zakaria is comparing the conservative group to a radical Islamist sect, rehashing the same tired comparison other liberal journalists and pundits have made before. You see, he has his own Tea Party, and this one has an army of its own. Last Saturday, members of the group formally called the Mahdi Army, now called the Peace Brigades, paraded through the streets of Baghdad by the tens of thousands displaying their readiness to supposedly protect holy sites and shrines. Remember the name Muqtada al-Sadr? He is the radical Shiite cleric who fiercely opposed the U.S. occupation of Iraq. Back then the Mahdi army was responsible for some of the deadliest days of the war. The mindset of the mainstream media toward the Tea Party is apparent when they are associating the conservative group with radical Islamists, simply because they both fit under the liberal definition of ‘extreme’. All of these efforts have one common goal in that they are a concerted effort by the liberal media to de-legitimize the Tea Party as a force in American politics. FAREED ZAKARIA: Now for our What in the World segment. It seems that everyone, President Obama, John Kerry, NATO, Grand Ayatollah Sistani, even the Iranian government–has the same advice for Prime Minister of Iraq, Nouri al-Maliki. Form a broad-based inclusive government that reaches out to the Sunnis. That would take away some of the sense of grievance that fuels their support for radical Sunni groups like ISIS that are threatening Iraq's existence as a nation. So why in the world is Maliki flatly refusing to do this? Partly is because he's a hard line Shiite politician himself whose party draws its support from the Shiites who are not particularly well disposed to the notion of being nice to the Sunnis, their former overlords. 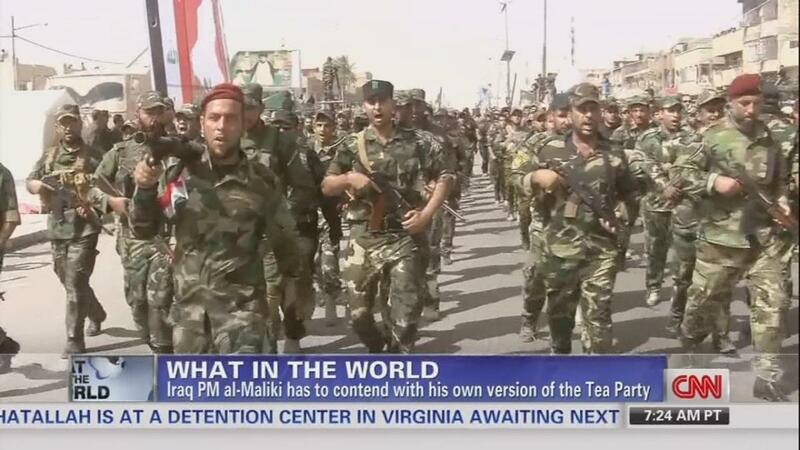 But it's probably at least as much because Maliki needs to worry about radical Shiites as much as radical Sunnis. You see, he has his own Tea Party, and this one has an army of its own. Last Saturday, members of the group formally called the Mahdi Army, now called the Peace Brigades, paraded through the streets of Baghdad by the tens of thousands displaying their readiness to supposedly protect holy sites and shrines. The group's name might be new but its leader is a well known figure in Iraq and dominated the U.S. media during the American occupation. Remember the name Muqtada al-Sadr? He is the radical Shiite cleric who fiercely opposed the U.S. occupation of Iraq. Back then the Mahdi army was responsible for some of the deadliest days of the war, then he overplayed his hand. The U.S. got other Shiite leaders to turn on him, issue an arrest warrant and in 2007 he fled to Iran where he sought exile and supposedly studied theology. But when he returned in 2011 his followers remained loyal to him and he wields real political power in Iraq. Al-Maliki got to keep his job as Prime Minister after an inconclusive election in 2010 largely because Muqtada al-Sadr helped him to build a coalition thereby ending months of political deadlock. Since then, al-Sadr has called Nouri al-Maliki a dictator and in a very surprising twist, recently added pressure on him to step down by calling for the creation of a new emergency government right after Maliki rejected the idea. Al-Sadr urged the Iraqi government to incorporate moderate Sunnis who have been marginalized in order to quell the bloodshed. Now al-Sadr appears to be trying to become the new power broker of Iraq condemning ISIS and the Sunni terrorist groups but also appealing to moderate Sunnis. Whether or not he succeeds, we are probably witnessing serious splits in the Shiite coalition and that can only mean more chaos in an already chaotic situation.